A Socially Dynamic Organisation is not just a mild reworking of a formal one: it’s not just a case of repainting it and adding some alloys. It’s a fundamentally adapted creature: an organisation that is evolved to be fit for the constant change of the Social Age. But i am no idealist: i’m a pragmatist who believes we achieve great changes with aligned mindset and energy, through taking small but measurable steps. The trick: to do so in great company, to align the effort, and to relinquish control. I’ve written before how changes starts right on our own doorstep, with how you and i behave differently, in the moment, everyday, but how does that relate to the overall Dynamic Change framework? Well: whilst organisational change, to build a Socially Dynamic Organisation, will involve work over a number of years, and a wide range of areas, from learning, to leadership, HR, IT, and so on, it will still, when it comes down to it, start on a Monday morning at 8AM. And the results should be visible and measurable. Within the Change work, i use the concept of six week experiments, and six week change. The broad premise is this: as understanding dawns, as the scope becomes clear, it’s easy to be swamped by the magnitude of our challenge (and it is a vast challenge: to reboot an organisation, in it’s DNA). But we can get our heads around six weeks: start small, but be constant in our effort. We take big journeys one small step at a time. The worst result is that we focus on the middle space: projects are manageable. They take months, cost millions, and deliver easily quantified results. But projects, unaligned, unfocused, unconnected, will only lead to constraint. A single effort won’t change the organisation: it’s aligned energy and shared, devolved, vision which will do that. Being busy is easy: taking the right steps, however small they are, is hard. Focus on the small steps to transformation, and learn to be excellent as you go. 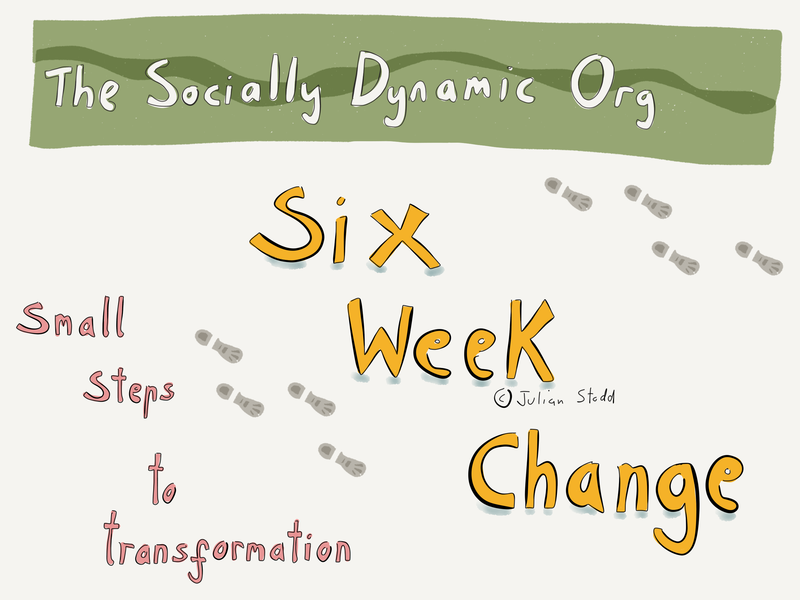 This entry was posted in Change and tagged Change, Change Curve, Experiments, Six Week Change, Socially Dynamic Organisation, Steps. Bookmark the permalink.